Anyone who’s ever been on a vacation or a business trip can relate to the fact that their memory is practically useless when it comes to packing everything they need for the trip. No matter how hard you try there always seems to be that one (or two or three) thing that you just forget to take with you. Well, not anymore. 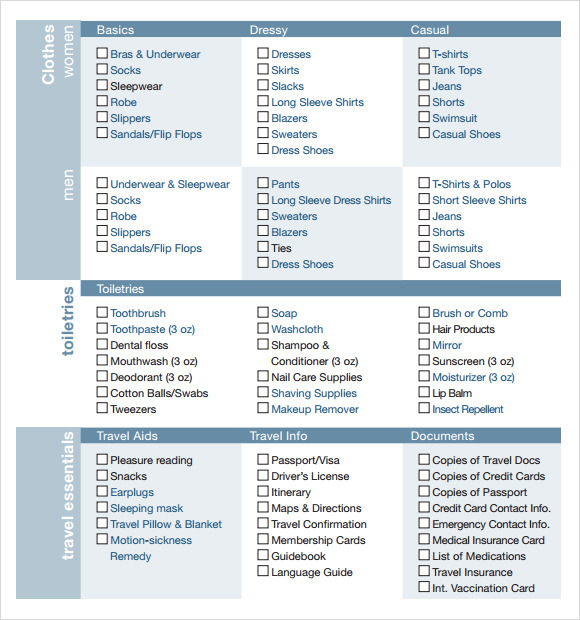 Use these free Sample Checklist Templates to have the perfect trip with all the stuff you need right with you. 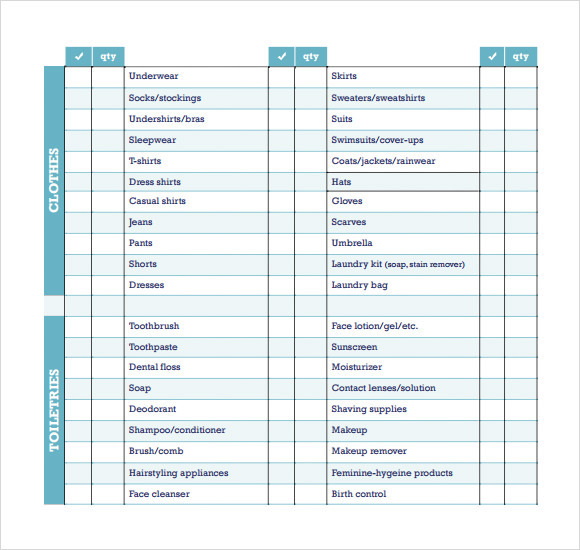 With these simple yet neatly designed travel templates, never forget anything again. The checkboxes and fonts are clear and bold with customizable size and color options. You can view the samples here and download the templates for free. 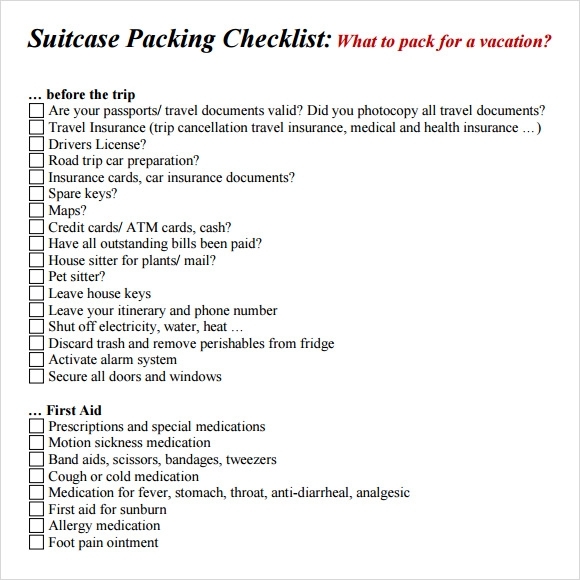 The user can tick of all the important elements that need to travel at the time of travelling with the help of the current packing checklist template. The design is very simple and elegant that can be used for varied purposes. This is a template that can be of great help in case you are thinking of shifting house. This template is one that can include various elements such as the bedding that shall be required, bath linen, kitchen ware etc. 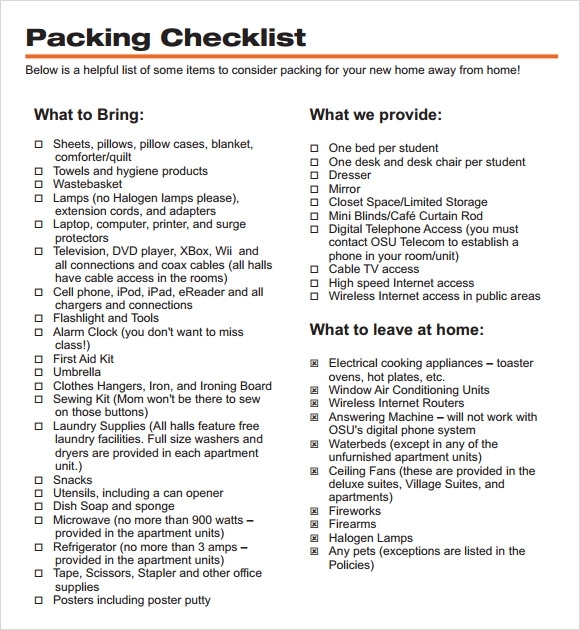 This packing checklist template is one that can be of great important for boarding schools. Such schools can use the current template as a mandatory that needs to be followed by students before they start their new sessions and comes down to their boarding schools. 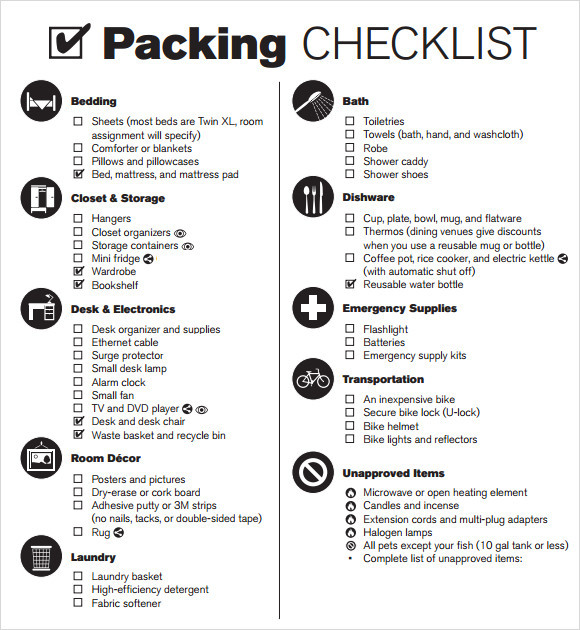 What are the Packing Checklist Templates? 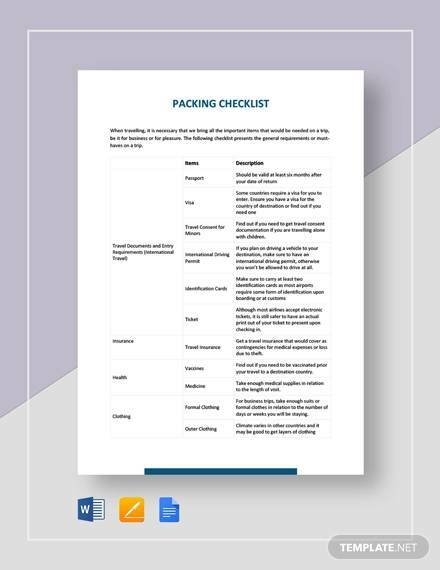 The packing checklist templates are formats that can be used for the purpose of creating a list that can be followed so that the most effective packaging can be done. The templates are professionally done so that the user is provided with the maximum array of items that they need to carry with themselves so that they shall be able to carry all the important things at the time of travelling. 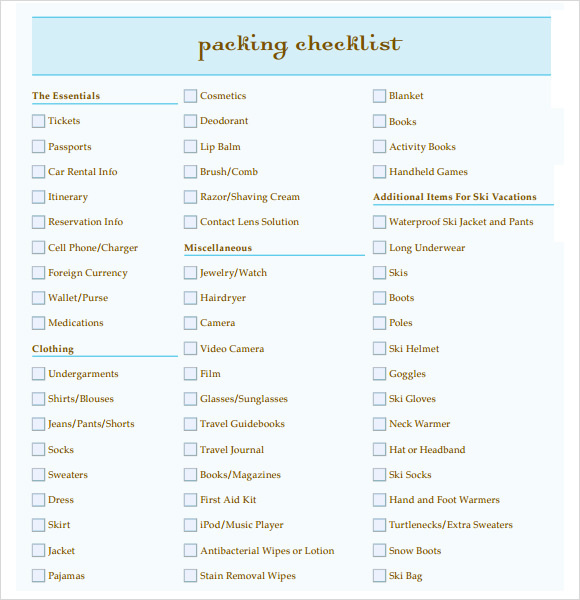 Who can use the Packing Checklist Templates? The templates are super exhaustive in terms of the list that they provide for the perusal of the users. 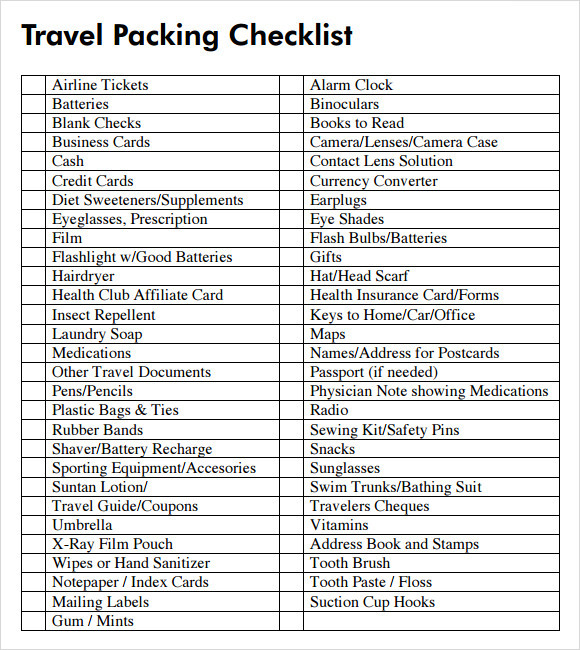 This helps the users to take all the required stuff that they need at the time of travelling. The designs often exceed the expectations of the users. This helps them to tick of things and items that they did not even think off. The templates are professionally done by travel bloggers. This is why the users can be very highly benefited. The templates are easily accessible that indicates at the fact that anybody can get them from internet with very simple search criteria since they happen to be highly SEO compatible. The templates are super customizable. The users can get to change the items on the list of the templates and also the way they have been displayed. The look of these templates happens to be highly organized and also very much systematic. 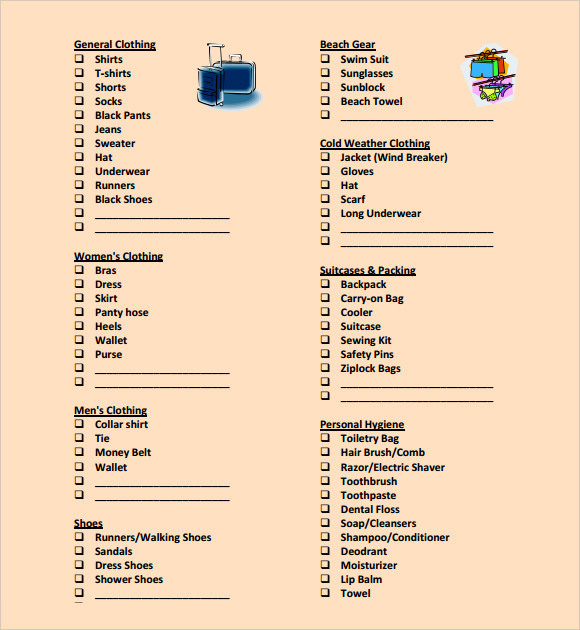 The packing checklist templates can be a boon for the travelers. They can reduce a huge amount and bulk of work for the travelers. 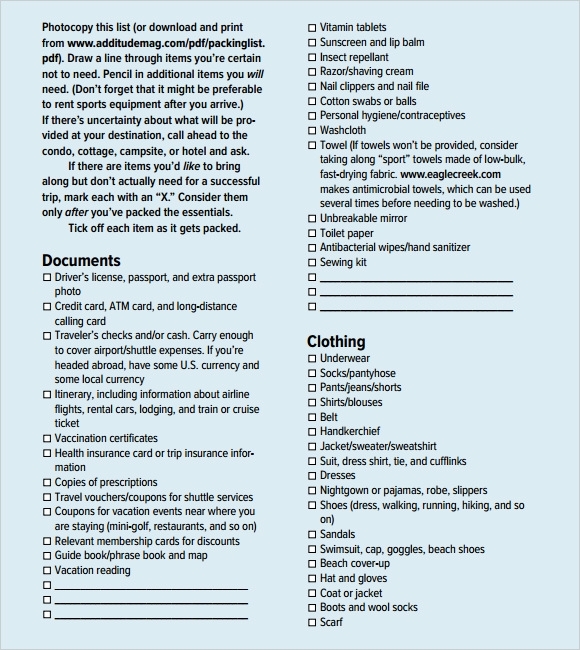 Now all they need to do is to download these templates and use them to see that whether they are carrying all the important things they need at the time of travelling or not.